Joseph S. Francisco, dean-select of the College of Arts and Sciences. The University of Nebraska-Lincoln has selected Joseph S. Francisco, former president of the American Chemical Society and member of the National Academy of Sciences, as dean of its College of Arts and Sciences. Senior Vice Chancellor of Academic Affairs Ellen Weissinger announced the appointment of Francisco as the next leader of the university’s largest college on Friday. Francisco, who currently is the William E. Moore Distinguished Professor of Earth and Atmospheric Sciences and Chemistry at Purdue University, will begin his UNL tenure July 1. The appointment is pending approval by the University of Nebraska Board of Regents. Francisco – who in more than three decades as a scholar and researcher has made important contributions in the field of atmospheric chemistry – brings a combination of scientific achievements and visionary leadership to Lincoln, Weissinger said. “As a researcher and an educator, Joe has demonstrated the highest level of performance at every stage of his career and he has a rare talent for inspiring excellence in others,” Weissinger said. “His spirited leadership style focuses on enhancing undergraduate education, furthering important interdisciplinary research, and building a rigorous academic culture that evokes great value from diverse people and ideas. The College of Arts and Sciences is made up of 5,600 students, or 23 percent of the UNL student body. Its 18 departments, 44 centers, programs and institutes, and its 16 pre-professional programs offer 38 majors and 57 minors. Francisco said UNL’s strong culture of interdisciplinary collaboration – faculty and staff working across different fields to expand research and create opportunities for students – was a large factor in his decision to come to Nebraska. “There’s a lot of discussion in higher education about working across disciplines. UNL is taking a leadership role in advancing innovative research at the cutting edge across multiple disciplines, and that is exciting,” Francisco said. Francisco served as president of the American Chemical Society, the premier organization for chemists and chemical engineers with a membership of more than 160,000, from 2009 to 2010. He has received an NSF Presidential Young Investigator Award, an Alfred P. Sloan Fellowship and a Camille and Henry Dreyfus Foundation Teacher-Scholar Award. He also earned an American Association for the Advancement of Science Mentor Award and a John Simon Guggenheim Fellowship, which he spent at the Jet Propulsion Laboratory at the California Institute of Technology. Francisco also is a fellow of the American Physical Society, the American Association for the Advancement of Science and the American Academy of Arts and Sciences, has published more than 400 journal articles and has co-authored the textbook “Chemical Kinetics and Dynamics.” From 2006 to 2008, he was president of the National Organization for the Professional Advancement of Black Chemists and Chemical Engineers. He received a bachelor’s degree in chemistry at the University of Texas at Austin and a doctorate in chemical physics at the Massachusetts Institute of Technology. “I’m passionate about what I do, and my collective experiences have given me a sense of new directions we’ll need to take to serve the citizenry of this state and this country,” Francisco said. “The research enterprise is becoming more global, the expectations of student preparation are changing and there are many new opportunities for us to change how we do things in research and in the classroom. Francisco and his wife, Priya Rajagopalan Francisco, have three daughters. Rajagopalan Francisco, an economist and marketing expert, will join UNL as business solutions director for the Office of Research and Economic Development. She will work with UNL Industry Relations and Nebraska Innovation Campus personnel to recruit, mentor and support new businesses, start-ups and entrepreneurs at Nebraska Innovation Campus. 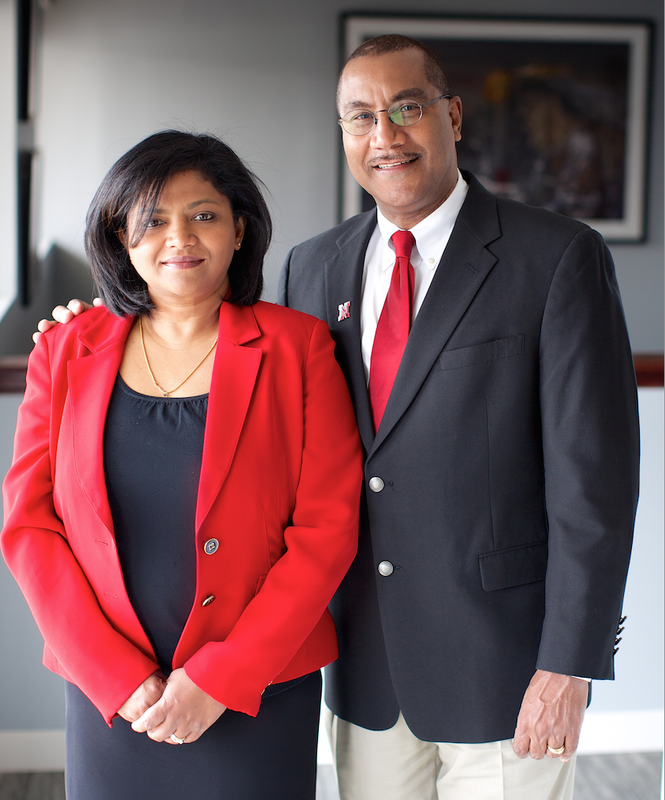 Priya Rajagopalan Francisco (left) and Joseph S. Francisco.